Born at Minjilpirri, south of the salt lake Wilkinkarra (Lake Mackay), Johnny Warangkula Tjupurrula's childhood was spent living a traditional lifestyle in the desert. Later, the family moved to Hermannsburg Mission, where Tjupurrula worked as a labourer constructing the airstrip. During this time, Tjupurrula passed through the initiation ceremonies for manhood. He then moved to Ikuntji (Haasts Bluff) for construction work, and later worked in Watiyawanu (Mount Liebig), Yuendumu and Mount Wedge. In 1954 he was chosen, along with Nosepeg Tjupurrula, to meet Queen Elizabeth II in Toowoomba, Queensland. In 1958 he travelled to the country around Wilkinkarra with Welfare Branch patrol officer Ted Evans, visiting Tjikari, a rockhole site north of Sandy Blight Junction. Tjupurrula had returned to lkuntji when the bulk of the population was moved across to the new settlement of Papunya in 1960. For the rest of his life, Tjupurrula lived mostly in Papunya with his wife Gladys Napanangka and their extended family. His principal homeland site was Kalipinypa, a 'native' well north-west of Sandy Blight Junction. Tjupurrula was serving on the Papunya Council when Geoffrey Bardon arrived at the settlement and began encouraging the older men to paint their traditional designs. 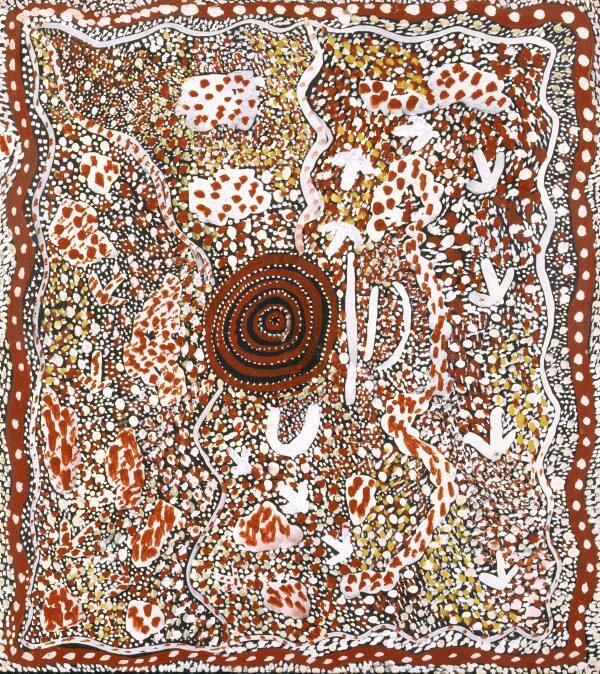 Tjupurrula's work from the mid-1970s – such as 'Emu Dreaming', 1974 is typical of the experimentation that marked the founding Papunya Tula artists' development of a simplified iconography. This more painterly approach signified their expanding encounter with the outside world. From the movement's earliest days, Tjupurrula developed a distinctive personal style of overdotting, often of several layers, creating effects that Bardon called 'tremulous illusion'. 'Johnny W' remained a major force in the movement until the mid-1980s, when his output was reduced by failing eyesight. In 1984, the inaugural Director of the National Gallery of Australia, Canberra, James Mollison chose to be photographed alongside Tjupurrula's large canvas 'Yala Dreaming', 1982, and declared the work of the Papunya artists to be the 'finest abstract art ever produced in this country'. Vivien Johnson, Tradition today: Indigenous art in Australia , 'Johnny Warangkula Tjupurrula', pg. 162, Sydney, 2004, 162, 163 (colour illus. ).